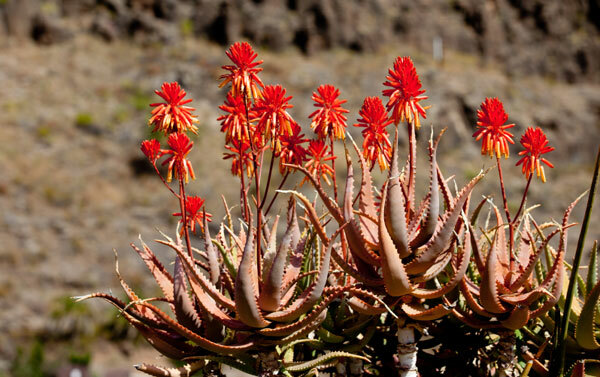 Succulents are any plants which are adapted to store water. This means that they can live in dry areas, where there is not much rainfall, or it only rains at long intervals. They come in all sorts of shapes and sizes from the tiniest plants to giant trees. Some succulents store water in their stems or roots. 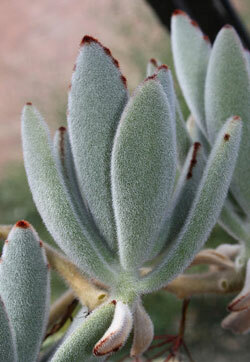 Follow the links above to find out more about these different types of succulent. The plant on the left is commonly known as the panda plant, and is usually easy to grow. Many succulents have small, but very beautiful and interesting flowers. We have some pictures of them in Succulent flowers. Most succulents can be grown in the same way as cacti but others need special treatment. See Lithops.